One and 1/2 miles E-NE of Sombrero Lighthouse. An Ivory wreck lies on west end of Shoal. Delta Shoal wreck lies behind the east end. Delta Shoal is a spur-and-groove coral reef, lying in shallow water. It is an excellent snorkeling reef. 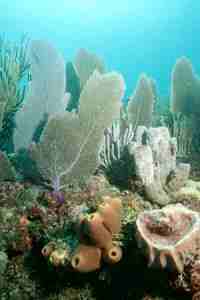 Its rather extensive coral fingers extend for over 1/2 mile. The best diving is on the scattered coral heads around the outside of the reef. Under the numerous ledges, spiny lobster are plentiful, as are the grunts, moray eels, and jacks. Nurse shark are frequent visitors. Pictures and information above courtesy of Jonathon Brinkman for Middle Keys Dive Shop. The day we went to Delta Shoal it was quite busy with divers. Our 5'8 draft (fully loaded) was a bit more than the area where we were could handle. The weather was a bit suspect that day and we decided not to move closer to the Shoal. Lots of powerboats out there and people in the water made moving about a bit hectic. Now that we have the GPS coordinates and depths, it will be an easy sail to Delta Shoal and check out the reefs firsthand. We could see many areas of the reef from aboard as we sailed back to our home port. We will definitely be going back to Delta Shoal. It's breathtaking!